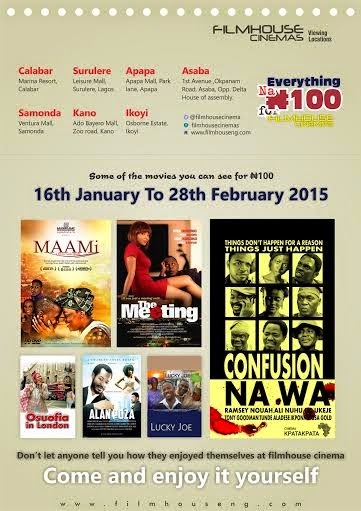 Be part of the Everything Na N100 season in Filmhouse cinemas all through 16th January to 25th February. Get value for more with the FilmHouse Experience. Filmhouse Cinema is an exclusive brand in cinema trade in Nigeria and they bring to you this mouth-watering promo for your pleasure labelled ‘Everything na N100’. This promo enables any Cinema Lover to go to any Filmhouse Cinema across Nigeria from January 16th 2015 –February 28th 2015to watch a selected Nollywood film and purchase any retail product at the lowest rate of N100 from 10am-12pm during weekdays.